The Edible Campus: Transforming an urban hardscape into a herb garden. Minimum Cost Housing / Hackathon Group wins 2018 National Urban Design Award for unique project in Kuujjuaq. Bringing together an interdisciplinary design team from southern Quebec with more than 60 residents, the Kuujjuaq Hackathon, a five-day event in September 2017, capitalized on local building expertise and leadership to reimagine key public spaces. The unique initiative won in the Small and Medium Scale Urban Fragments category. The Minimum Cost Housing Group (MCHG) of the McGill University School of Architecture is a research unit with an international orientation that focuses attention on the human settlement problems of the poor. Poverty is associated with developing nations, but it exists both in the south as well as in the north, hence, our research has primarily been in poor nations, but we are also conducting research projects in wealthy countries. Housing research is a paramount activity of MCHG. The Group has participated in several international cooperation projects with the support of Canadian and International aid agencies. Research has been carried out on construction materials, small building components, low-cost sanitation and servicing systems, human settlements planning and urban agriculture. Field projects have been conducted in the Argentina, Sri Lanka, Uganda, Philippines, Mexico, Nigeria, India, and China. In addition, MCHG staffs have worked as consultants to the World Bank, the United Nations Environmental Program, the Canadian International Development Agency (CIDA), the International Development Research Centre (IDRC), the Bunco de Mexico, and the Housing and Urban Development Corporation in New Delhi, among others. Past Projects: Since its inception in early 1970’s, MCHG team has been involved in numerous action-research projects. In 1992, MCHG concluded 8-year collaboration with the Vastu-Shilpa Foundation in India; this was the CIDA-supported "Human Settlements Training" project, which focused on the formulation of appropriate housing standards for new housing developments in India. 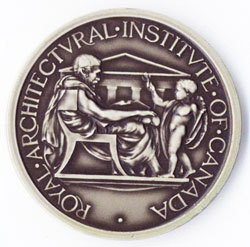 The project was recognized with the prestigious P/A (Progressive Architecture) Award, in 1991. For further information consult How the other half builds publications and Post-occupancy study of Aranya Project. From 1983 to 1996, MCHG was actively involved in both rural and urban China. Under CIDA-supported "Village Planning and Sanitation" project, the MCHG assisted the Chongqing Institute of Architecture and Engineering in the identification of appropriate and cost-effective standards for village planning and environmental sanitation. Two demonstrations were developed: a 1000-unit new housing project in the market town of Sifang, and the upgrading proposal for Jianlu, a 200-household village in the province of Sichuan. To disseminate the research findings, an international seminar was organized in Chongqing in February 1993: "Rural Housing - A First Step to Market Housing," with the participation of 40 Chinese delegates, and 10 international housing experts. The Sifang project was chosen as a winner in the international competition "Sustainable Community Solutions" organized by the American Institute of Architects and the International Union of Architects. In 1992, following a national competition, MCHG was selected by the Royal Architectural Institute of Canada to assist the Beijing Institute of Architectural Design and Research in the preparation of a housing redevelopment proposal for the Hua Shi Xie Jie neighbourhood in inner-city Beijing as part of the Beijing Housing Renewal Program. 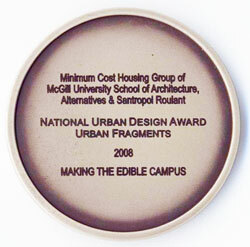 In addition, in partnership with several local NGOs, the group has initiated several Edible Landscape initiatives in Montreal, one of the most significant being Making the Edible Campus project on the main campus of McGill University that was the recipient of the 2008 National Urban Design Award of the Royal Architectural Institute of Canada, Canadian Institute of Planners, and Canadian Society of Landscape Architects; further information about it can be found at Making the Edible Campus Brochure. The Edible Campus was also recognized by the city of Montreal as one of the 10 most significant sustainable projects in Montreal in 2010. Dissemination of research findings is an important activity of MCHG. The Group has an active publication program with an international readership, and its publications. A number of graduate students in the School of Architecture have worked on research reports related to the subject of Minimum Cost Housing we are in the process of making the titles and abstracts of these reports available on line; the partial list can be found at: List of theses. In addition a number of these reports are made available in their entirety on line.